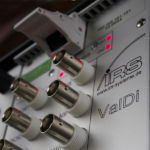 IRS Modular TestStand User Interface is a custom user interface for executing test sequences created for National Instruments TestStand. It acts as a front-end for the TestStand API, which is executing the sequences. can be found in a extended expert view. The operator view can be fully customized to your needs and dynamically be replaced as a module. Furthermore the expert view can be extended with specific plugins considering your requirements. The GUI can handle all standard NI Models (Batch, Parallel, Sequential) and automatically manages and displays data for multiple test sockets. UUTs can be assigned to a specific “Test Station” and “Panel Nr” via additional StepTypes. This is for display and reporting purposes only and can be used in environments where the current location of the UUT should be visualized, like in a round table (this feature is implemented but currently unused in included views). The GUI supports multiple languages in most controls. Currently two languages are shipped (english, german) but this can be extended. The GUI supports the newly introduced NI UUT property “PartNumber” as a product identifier. The product id is used for grouping features and analytics (error statistics, result statistics, result history grouping). The GUI can count any result (passed, failed, error, terminated, …) grouped by product id. This statistic data is stored in persistent XML files. Counting can temporary be disabled during maintenance or development to avoid counting invalid results. In addition to the application log and TestStand reporting features, the GUI provides an optional result logger which can be used to track each UUT’s result, date, serial, product id and some other critical information into a custom logfile, even without TestStand reporting being enabled (optional). In a production line, the terminate function is not always the best choice to end the testing cycle. The GUI’s stop button can be customized to either just set a flag in TemporaryGlobals or to directly terminate all executions. The GUI is built on most recent technologies like WPF, PRISM, MEF, MVVM to provide extensibility and flexibility for future demands. It consists mainly of a core and logical modules. Most of the modules can be exchanged by other implementations or disabled, if not required.